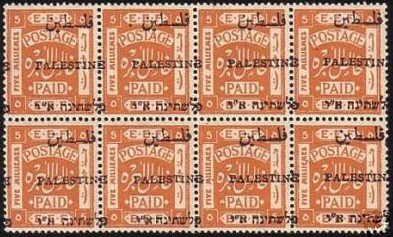 Three weeks after the issue of the first overprint series (Jerusalem I) a totally new overprint block was created (T5). Again it consists of the country name in three languages, but the Arab line is now longer: 10mm (instead of 8mm). The English line is also lengthened from 14.75mm to 15mm, and the Hebrew line varies (mainly due to the size of the word space) between 13.75mm and 15mm. The entire overprint design has now a vertical size of 20mm, the gap between the second and third line varies from 7mm to 7.5mm. 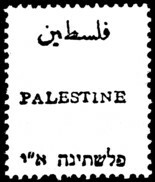 The specific characteristic of this issue (especially to delimitate it from the third overprint Jerusalem III) is the position of the inverted commas in the third, Hebrew line: they are slightly elevated in relation to the other letters. The new overprint plate (T5) consists of two separate plates (A1, A2) covering the top and lower 120 stamp blocks of a printing sheet. The inverted setting (A2 on top of A1) is also known. 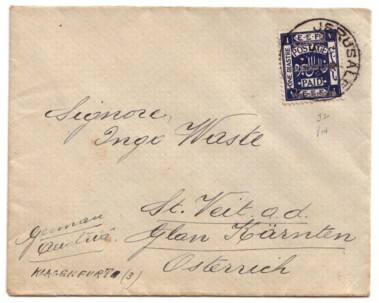 Cover directed to Austria with SG no. 42. Cancelled with JERUSALEM / 5 JY / 21 (Sacher B4). Details of the stamp from the cover shown on the left. 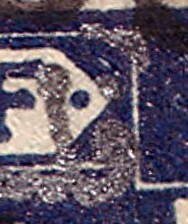 The triangular-shaped angle/corner above the Arab F seems to be no recognized plate error. I haven't seen it mentioned in any literature. Horizontal pair of 2m, SG no. 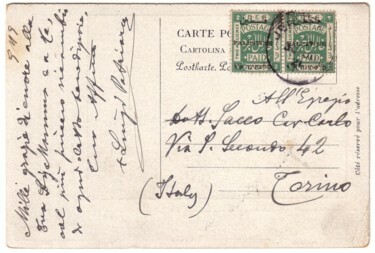 31, postmark JERUSALEM / 30 JU / 21 on a picture-postcard (showing the interior of the Omar Mosque) sent to Turin, Italy. Picture-postcard from Tiberias used with 4m domestic rate to Cairo: SG no. 33. 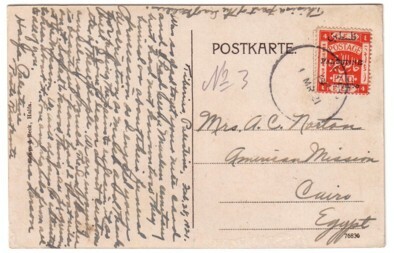 Cancelled with TIBERIAS / B / 1 MR 21 (Sacher 2). Note that between September 1920 and September 1921 inland and overseas rates for postcards were the same, ie. 4m. The stamps used for this local overprint were from the typographed issue continually reprinted since 1918, type T3. All the errors and varieties of that issue, including perforation and shades, appear also on the overprinted stamps---in addition to new varieties. This can be said for all four different Jerusalem overprints. various overprint varieties, partly missing overprint, double prints, offset on reverse, vertically or horzontally shifted. Bale no. 34G in block of eight stamps, clearly showing the effects of horizontally shifted overprint. The stamps were apparently overprinted only according to demand and placed on sale from 22.09.1920. That means there is often no official First Day and dates of first use have to be determined by analyzing post marks. 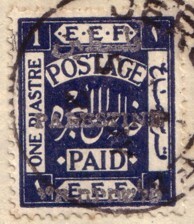 According to Bale the last value in this series was issued as late as June 1921.